Click on the Attractions headings below or on the "link" icons in the images for more detail about the featured Attractions. 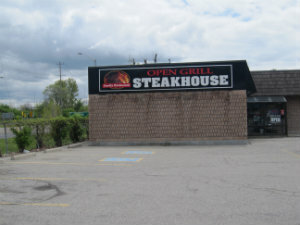 The Open Grill Steakhouse & Family Restaurant is one of those places that everyone wants to go to for Lunch or Dinner. Steve and Georgia Economou have been cooking Sarnia and Point Edward's finest steaks for the past 39 years. From their humble beginnings at the Gateway Steakhouse & Chipican Restaurant they now settle at the Open Grill Steakhouse. As a family run business, Steve Economou takes comfort in providing the community with a fresh new atmosphere and the same great steaks which Lambton county has come to know and love since 1972! The staff and owners of the Open Grill Steakhouse want you to enjoy yourself and they take pride in making sure you are well looked after. Great food, a full salad bar, and excellent portions in a very clean environment can be expected during every visit. All the staff echoes the friendliness that has made The Open Grill Steakhouse a very popular restaurant in Sarnia and Point Edward. Space Is Limited For Specific Events. Make Your Reservation Now!